Use our native GitHub integration to automatically attach GitHub branches, pull requests, and commits to stories and epics to see your code as it moves through the development process. This allows developers to create a pull request workflow and easily visualize progress with an at-a-glance view of code status. Exposing pull requests, branches, and commits in Tracker is a great way to get insight into your team’s development process, but attaching them manually can be tedious and prone to errors. With that in mind, we’ve created a new GitHub integration that will attach them all automatically! 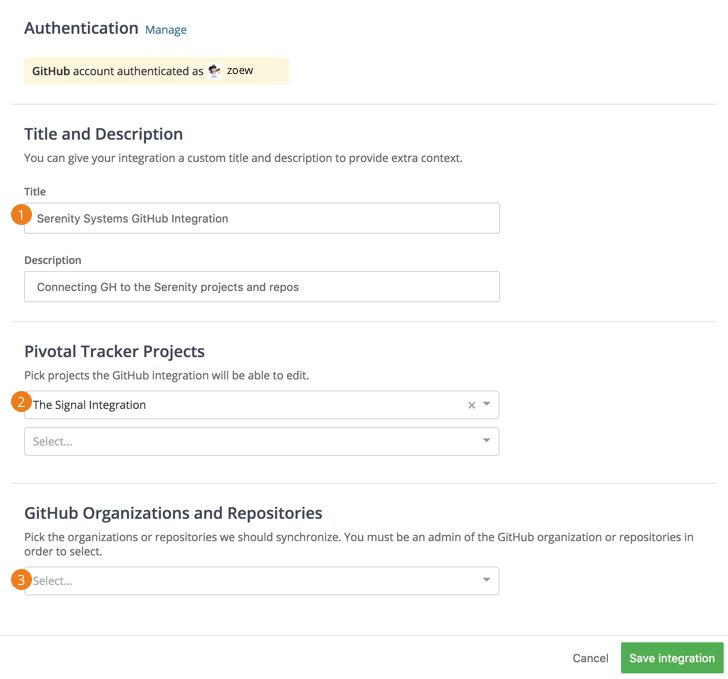 To enable this feature, create a new GitHub integration and authenticate with GitHub. For the GitHub integration to associate stories with commits, pull requests, and branches, you’ll need to include story IDs in your branch names and in your commit messages. Pull requests allow your team to review changes before merging them into your main branch. GitHub displays the status of any automated code checks here. To see a pull request’s automated tests, code reviews, and mergability in Tracker, attach a GitHub pull request to your story. Branches enable parallelization of work and compartmentalization of code that is not ready to be merged into the main Git branch. Here on the Tracker team, every feature has a branch that holds work until that feature is finished. To see branch information in Tracker, attach one to a story. Commits represent units of work and are the center of everything Git does. To see how your stories are progressing, attach commits to a story. The first step to GitHub Flow is to create a branch. (Tracker will do this for you and even suggest a nice name!) Next, when you make commits on your new branch, they’ll be displayed in the story’s activity. When you create a pull request, that’ll be displayed on the story, too. Finally, when all your pull request status checks pass, and everyone on your team agrees the code is good to go, you can merge your branch to master and deploy to production. The new integration uses GitHub webhooks behind the scenes to keep Tracker in sync with your code. Tracker is there every step of the way to surface the information that’s important to you. We strongly recommend that you remove any older Pivotal Tracker Service Hook integrations. In your GitHub repository, navigate to Settings > Integration & Services to remove them. Just a note: our new GitHub integration cannot be used with GitHub Enterprise. We also realize that not all teams use GitHub or Git for source control. Rest assured, we’re aware of these limitations and are hard at work extending integrations to support them. Take a look at the docs for integrating with an SCM that’s not Git with GitHub. To add a new GitHub Integration to a project, click the Settings tab in your project, then choose Integrations in the header. When adding the integration, you first need to connect your GitHub account to the Pivotal Tracker app. The GitHub integration requires write access to the repository and organization webhook permissions to manage the installation of webhooks. It’s important to name the integration with a Title so if you need to edit it you can remember which one was setup (for example, “Frontend GitHub Integration”). 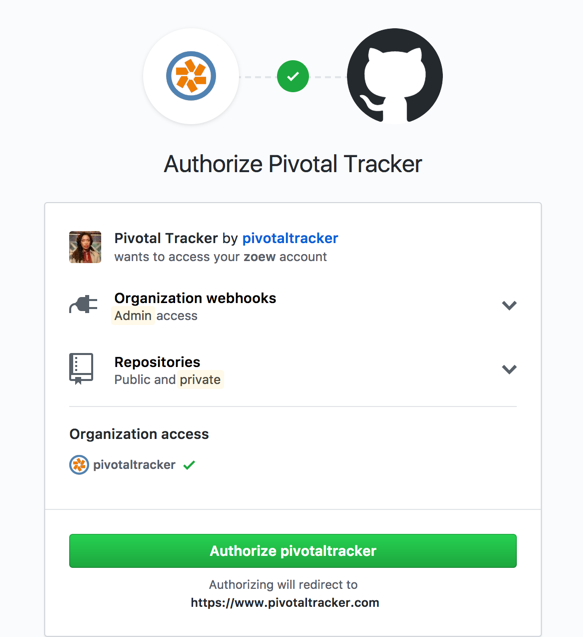 You’ll need to pick which Pivotal Tracker Projects the GitHub integration can access. On the GitHub side, you can either pick individual repositories or all repositories under an organization. You’ll need admin access to the GitHub repository or organization.